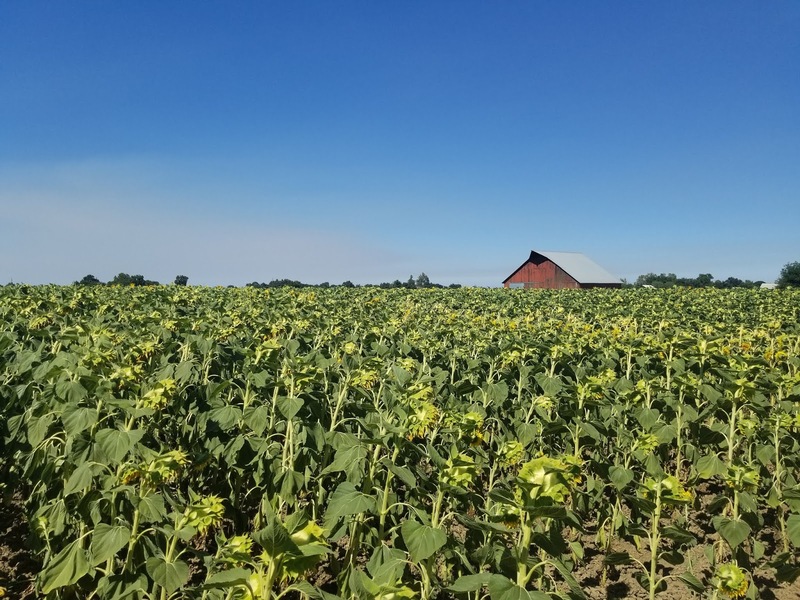 Nothing says summer like a Sunday afternoon, under the summer sun, with fields of small and large open faced sunflowers. So off we ventured to find just that. We didn't know exactly where to go to find our sun filled sunflower fields, but we did know we were headed to Woodland. With Phoenix napping in the backseat, it was the perfect time to invest on a drive that would entail some exploration. So I googled "sunflower field locations near me" on my phone, and Muller Ranch was at the top of the results page. It takes about 40 minutes from the downtown Sacramento region to this ranch location. As we got closer to our destination I started to see orange-yellow caped fields in the distance. I suspected they were sunflower fields but couldn't be sure. Then we arrived at our destination, but there were no signs that indicated it was a ranch open to the public or even a ranch. There were a few structures, including some that looked like peoples homes, surrounding crop fields, but no sunflower fields to be seen. After driving around twice, thinking I might spot even a sunflower, I decided we needed to go elsewhere to find what we were looking for. 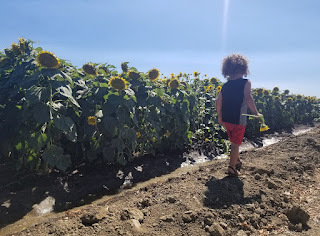 So of course I got back on Google, and I ran into visityolo.com and that's where I was directed to https://www.eventbrite.com/e/woodlands-sunflower-weekend-tickets-45443898925?aff=erelexpmlt and saw that they offer sunflower field tours twice a year, from Woodland to the Capay Valley. The tour package can vary from $30-$199, and offers accomadations, dining, etc. But I wasn't at all interested in a tour with people that would get in the way of our pictures, and I was definitely not interested in spending the money. 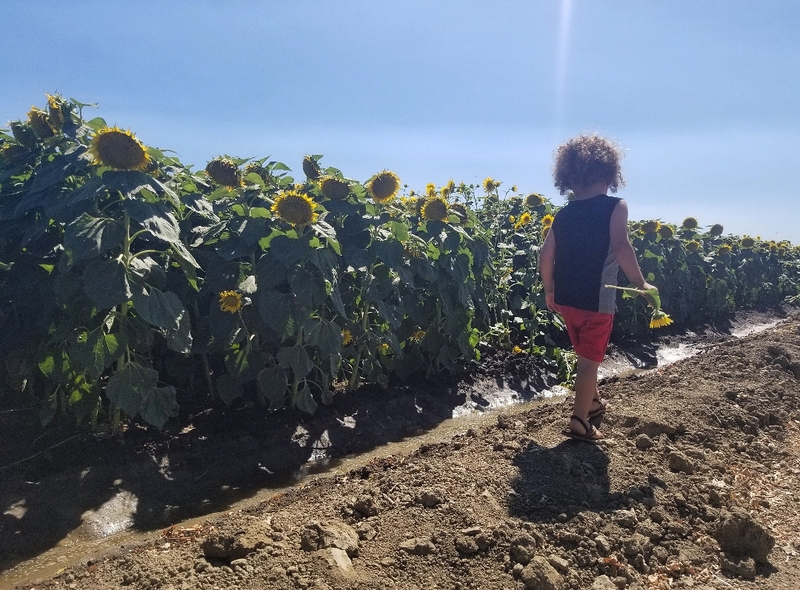 I was determined to see sunflowers for free. So, I kept driving, and this time without google or google maps. 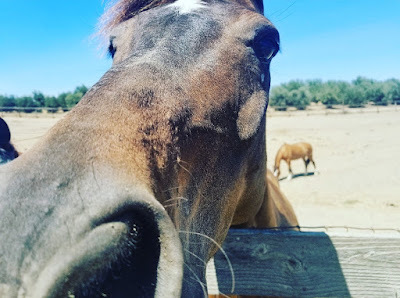 As we drove, we ran into the Woodland Stallion Station, http://woodlandstallion.com/ and since Phoenix was awake at this point, it was a great chance to get out of the car and get up close and personal with the horsies (as Phoenix calls them). As soon as we got out of the car the grazing horses made their way over to us, to get some love attention. 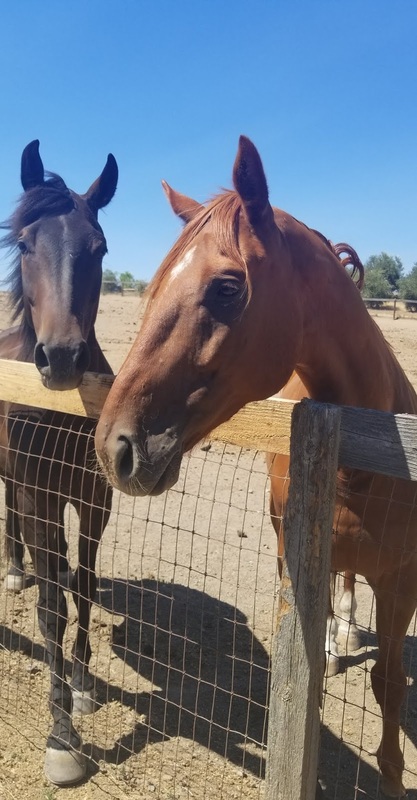 I could tell Phoenix was both excited and intimidated by them. 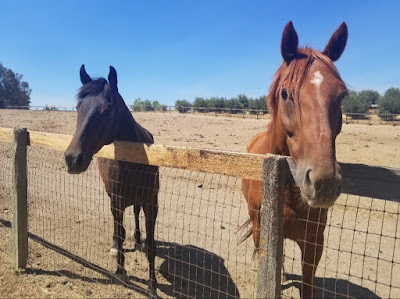 I was nervous that we weren't supposed to just drive up and pet the horses through the fence, but I made sure we didnt linger too long in fear of getting in trouble. We said our goodbyes to the beautiful stallions and quickly got back in the car. So off we drove to continue our search for sunflower fields. As we drove, we came past the Cache Creek Conservancy, Nature Preserve, which is only open during the weekdays, so there's another spot we can explore later. I then decided to turn around and drive back towards the area where I had seen yellow-orange caped fields, and as I was driving along something told me to make a right on Road 18A, and shortly after I made that turn I was absolutely excited to have "hit the jackpot." There it was, behold, sunflower fields! Phoenix looked out the window and started saying, "flowers, roses" and I said, "yes, sunflowers!" We pulled over and got out of the car to take pictures and enjoy the scenery. 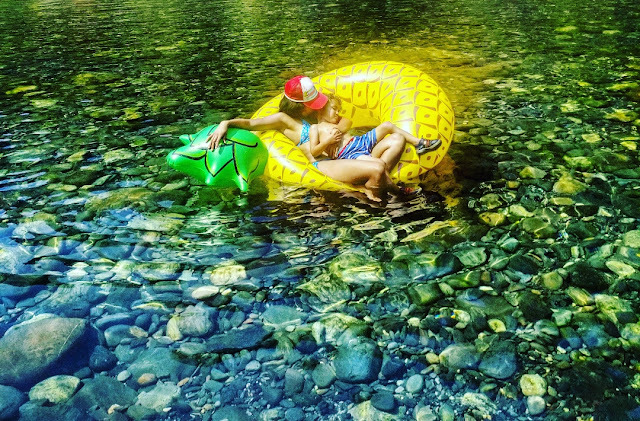 It was hot, and my skin felt like it was burning, but that didn't matter, we were finally there, just the two of us, and sunflowers. Phoenix walked around and explored, while I watched and took pictures. 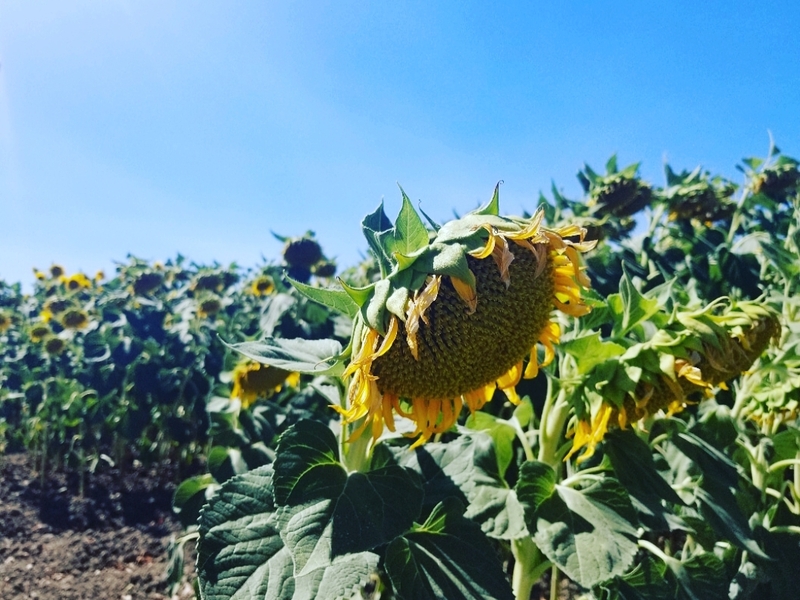 We didn't really go into the sunflower field for fear of trespassing, and damaging the beautiful flowers. We did, however, pick a couple of small sunflowers that had already fallen due to unknown causes. 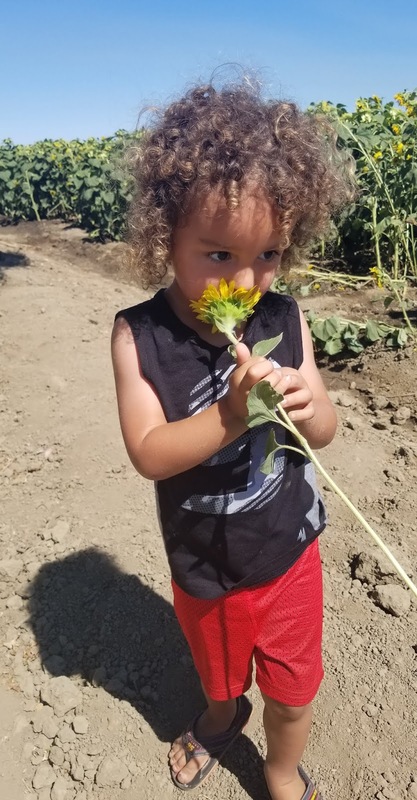 My favorite part of all was when Phoenix put the flowers to his nose, and sniffed them, like the skunk in the movie Bambi or the bull in the movie Ferdinand (can you tell I watch too many kids movies?). 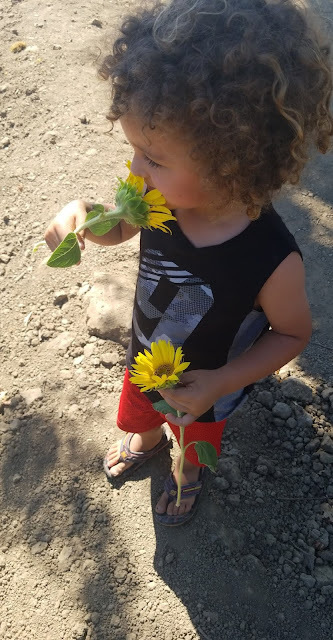 He often does this when he picks flowers, and I fall in love with it each time. After enjoying these beautiful moments, it was time to put our journey to an end, so we got back in the car and started heading home. 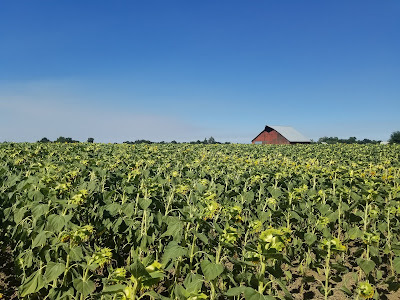 On our way out, we ran into two more sunflower fields. I stopped to snap a quick photo of one of them, and continued on. As I drove off, my mind was in its thoughts, jumping in excitement, "We did it! We found our fields! And we're coming back!" If you're coming from downtown Sacramento, it will take approximately 40 minutes. If you are coming from anywhere else, make sure to hit hwy 5 North towards Redding. Sunflower emojis indicate sunflower fields on that road. From downtown Sacramento you want to get on hwy 5 North towards Redding, and continue for about 11 miles. Then make sure to stay on 5 North towards Woodland/Redding for about 7 more miles. Wear closed toe shoes if you don't want your feet/sandals to get dirty/muddy. Otherwise go completely barefoot! Then at least you wont have shoes to clean. Hi, I don't know if you have other friends who are called Alexia. I will just name myself Alexia No1. You have finally made a step forward to share with the world your life with Phoenix which is amazing. And, congratulation! 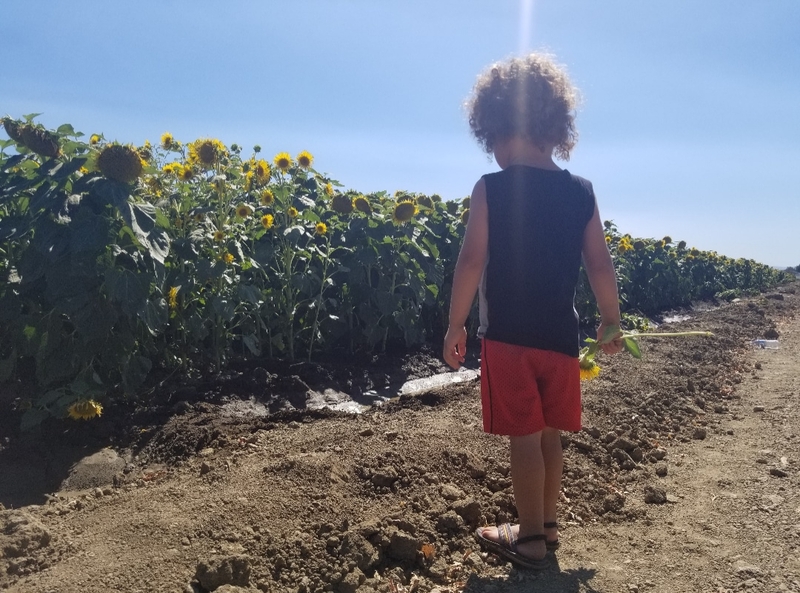 Before I had my child, my sweetheart and I stopped by a sunflower field off the freeway near Woodland but the sunflowers were all dried up. We decided to return some other time but never did. We have to try again next year hopefully! Admired by many but loved by me....oh sunshine just light us, we thrist for thee... when sadness approaches just look at her shine..her smile is all over, sad eyes see don't cry.......this flower so precious just stears at the sun...she feeds of his energy and brightens our life.... shes elegant sensual shes tall and has pride....when sun light says goodnight she bows and says bye.......yet loyal as usual shes up to say hi....yet we come we feed of her chunky delight....not selfish ahe let's us indulge harvest time...don't worry I'll come back to brighten your life let's shine like a sunflower full of delight....when storm hits dont give up just get up and shine....God gave us this beauty to teach us to live....like her be a soldier stand straight smile and win..by Patty Portalanza July 13, 2018 9:54 am...inspire by one of my favorite flowers "SUNFLOWER"
Love it! Yore making me want to hit a sunflower field. It's so funny how this past week we were in Woodland and as we were driving, we saw a field of sunflowers. 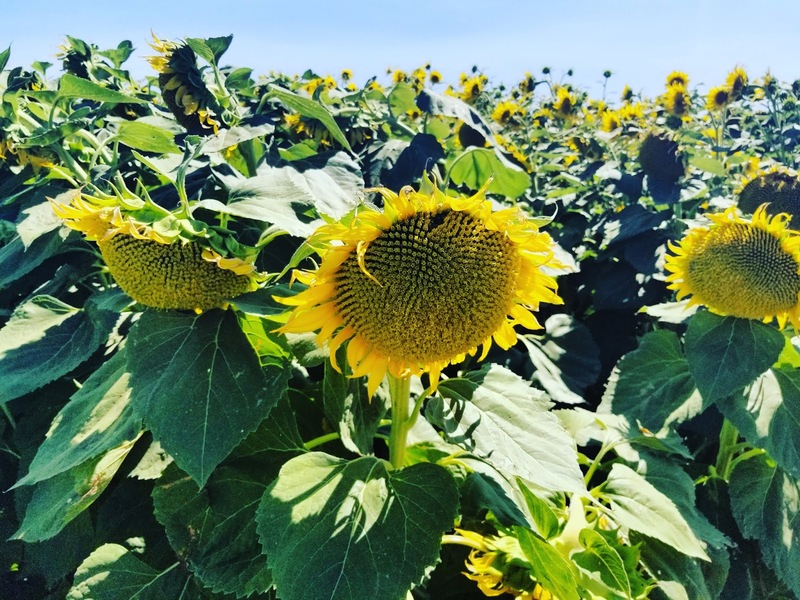 We were so tempted to stop the car and have a sunflower photo shoot!! Thank you for leaving comments!